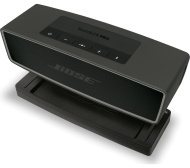 alaTest has collected and analyzed 363 reviews of BOSE SoundLink Mini Bluetooth Wireless Speaker II - Black. The average rating for this product is 4.8/5, compared to an average rating of 4.1/5 for other Audio Systems for all reviews. We analyzed user and expert ratings, product age and more factors. Compared to other Audio Systems the BOSE SoundLink Mini Bluetooth Wireless Speaker II - Black is awarded an overall alaScore™ of 89/100 = Very good quality. Buttons to change volume, Bluetooth etc. are far too hard to press in. Great piece of kit, Bose is the best. Cannot get it to work with Dell laptop running windows 7 and using a wireless mouse and keyboard. Device beeped the whole time when plugged into mains! Couldn't get battery to charge! Had to return it! Absolutely the best mini speaker ever! !